LONDON — A rare British-owned gemstone steeped in history and intrigue sold for a record price of $30,000 per carat on September 24 at Bonhams’ jewelry sale. The previous world record price per carat for a faceted Spinel was $16,000, which was set in 2013. This exceptional gem was bought by a private telephone bidder. Bidding came from round the world via 18 telephone lines, online and from bidders in Bonhams New Bond Street saleroom. 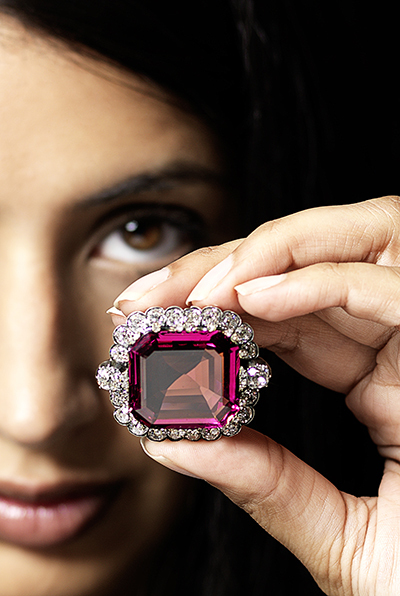 The firm’s chief executive officer and global head of jewelry Matthew Girling led the auction of the Hope Spinel. The Hope Spinel was part of one of the world’s greatest gem collections until its owner – London banker Henry Philip Hope – died in 1839. Set in a Nineteenth Century silver and gold brooch, the huge 50.13-carat octagonal-cut stone is the size of a small plum and of similar coloring with a rose hue. Until this auction, it had not been offered for sale since 1917 when it went for the equivalent of $120,000 in today’s money.